One compact monitor for all machine types – from single blow headers to multi-station formers. 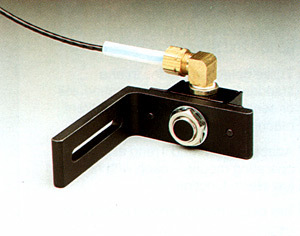 Detects separation gap to within .00004 inches (1/1000mm) at speeds up to 1200 SPM. 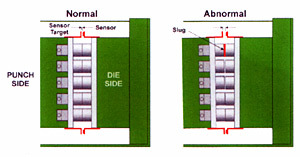 Three detection modes in one standard system – no extra modules or sensors are required for different machine types. Bar graph display shows positive or negative deviation between sensor and target. Alarm limits are automatically adjusted. No complicated programming required. High and low deviation setpoints are displayed at all times. Built-in alarm detects decrease in RPM for early indication of problems with machine motor. Frame mounted proximity sensorsused by the cold heading monitor detect variations in ram position at front dead center. Machine stop is initiated if off-tolerance condition occurs. DM-315 Installation Kit for the cold heading monitor include two proximity sensors, adjustable mounting bracket, junction box and oil tight fittings. 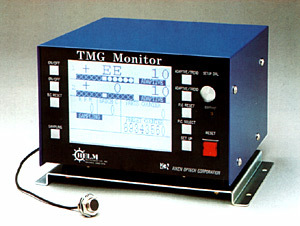 Each TMG-1200 Cold Heading Displacement Monitor is supplied with mounting bracket, DM-315 Installation Kit and instruction manual. The system is available for delivery from stock.